Hedge funds are more than just simple investment firms trying to generate positive returns. They are more than just the result of simple model output or the musing of a portfolio manager. The best hedge funds are "systems". Hedge funds are no different than a factory processing plant which is a production system. The outputs from the system are ultimately returns and the raw input is information. The investment management of the fund is the processing of the inputs to ensure alpha generation that is repeatable with a high level of quality control. To conduct good due diligence requires understanding the hedge fund system from raw inputs to the delivery of the output. Different managers have different quality control and different investment processes. They offer different product lines and they show different combinations of alpha and beta. The purpose of due diligence is to understand the factory, get inside the plant, and determine whether the complete process is repeatable and adaptable. You cannot tell the quality of the factory process by just looking at the output. You will never know if you just got lucky with the output or if there is actual skill. You also want to determine whether the hedge fund is a skilled artisan who has skills that may not be easily taught or whether the factory is scalable because the process is repeatable through computer models. The focus on system design is distinct and a different way of thinking about the investment process. Yes, there are investment artisans which we admire, but they may not be able to handle scale, multiple accounts, and a changing business environment. The process may not be broken down into a system. A true investment system is self-repairing and adaptable. Thinking through the system approach starts with the function and purpose of the hedge fund firm. The easy response is that the purpose is to generate returns, but a system analysis has to look deeper at the elements that allow the process to work and the feedback loop for how the system will adjust. This requires a review of how the parts of the investment process are interconnected or how return analysis is fed back into the research process. We learn about the purpose of the fund through its behavior and not its words. 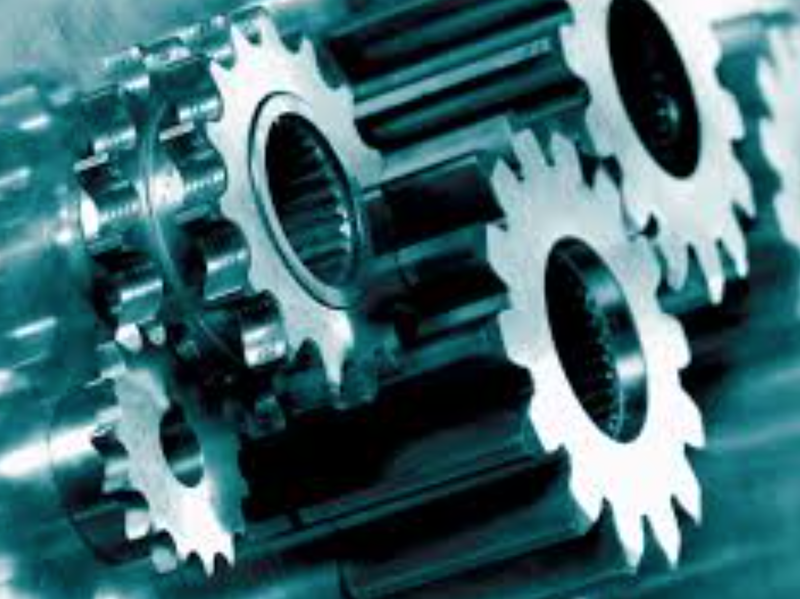 Taking this factory or engineering approach to the hedge fund system means walking through all of the parts of the process that are necessary for success. If the manager is a quant, a review of data processing is required. If it a value investor, the quality of meetings with management may be more important. Form follows purpose and behavior. This is more than just looking at performance. ...there can be few fields of human endeavour in which history counts for so little as in the world of finance. The great economic historian is making the point that finance does not take good account of history in its thinking. This lack of historical context has come back to haunt finance professionals on a regular basis, yet few know what a history of finance means. I don't think there are any courses on the topic taught at major MBA programs. 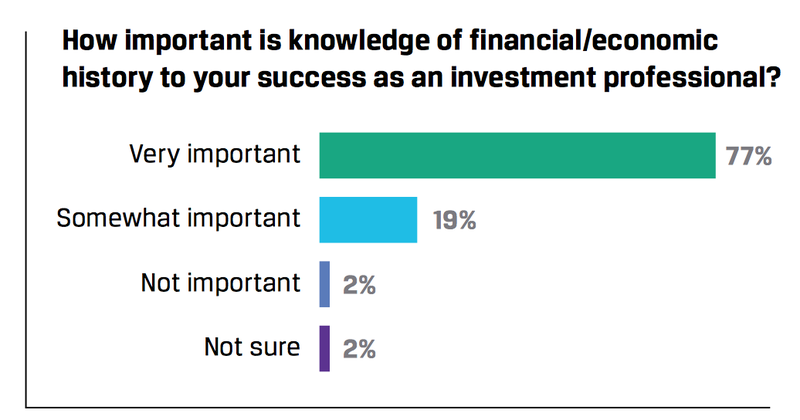 The survey results were from a CFA Institute Magazine article, "Should Financial History Matter to Investors?". In the article, there are references to two roundtables, one in London and the other in Boston on "Financial Market History". All of these articles are disappointing because they do not address what it means to know or learn from history, yet there seems to be a hunger for history. History is not about just being able to remember facts about past events. Remembering is not enough. Bubbles are not just the result of forgetting the past lesson that investors can take views to extremes. What history should do is tell us about the value of context. Events follow a path because of the broad context of economics, politics, psychology, and technology at time and place. Markets are efficient not because they use all information but because they reflect the views of investors, regulators, policy-makers, and consumers.Unfortunately, the cliche that history does not repeat itself but rhymes does not illuminate the importance of context. History will often tell us that everything will not turn out in the end. There are bad outcomes. Actions matter. Failure is real. The survivors will tell you otherwise because they are survivors. The regulation of today was caused by the context of past age. If you forget the savings and loan crisis, you will not be ready for the mortgage crisis. If you do not remember Ponzi, you will be surprised by Madoff. History diminishes the factor of surprise. Of course, there will be surprises, but for the person steeped in history there will be fewer and the cost of being surprised should be reduced. We are already forgetting the surprise of the Financial crisis because the context of today is just what happened yesterday. I don't know the answer of how to incorporate history in finance but for those who take the time to learn the past the future will be clearer. There has been the view that FOMC announcements are usually associated with stronger equity moves; however a closer looks suggests that the up move is only really associated with surprise cuts. 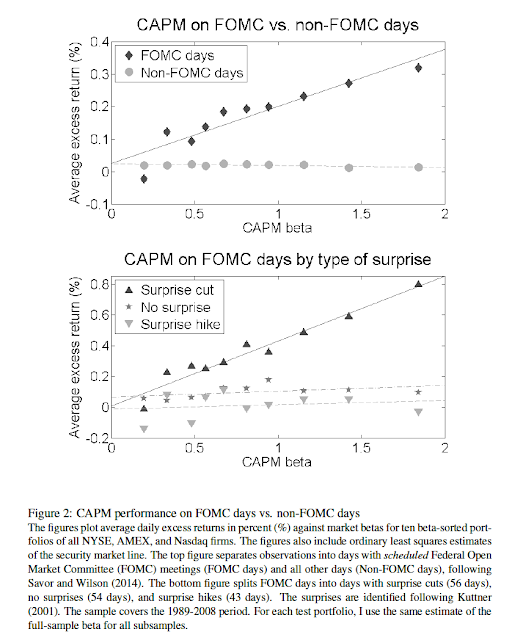 The behavior of equity markets on FOMC announcement dates when the moves are anticipated or when they are higher are not different than non-announcement dates. This response to a surprise is expected in a rational expectations world but it clearly places focus on the surprise cut portion of a change. The markets seems to value the surprise as validation of the Fed put on easing. These empirical issues have been described well in "FOMC Announcements and predictable returns" by Mihail Velikhov. 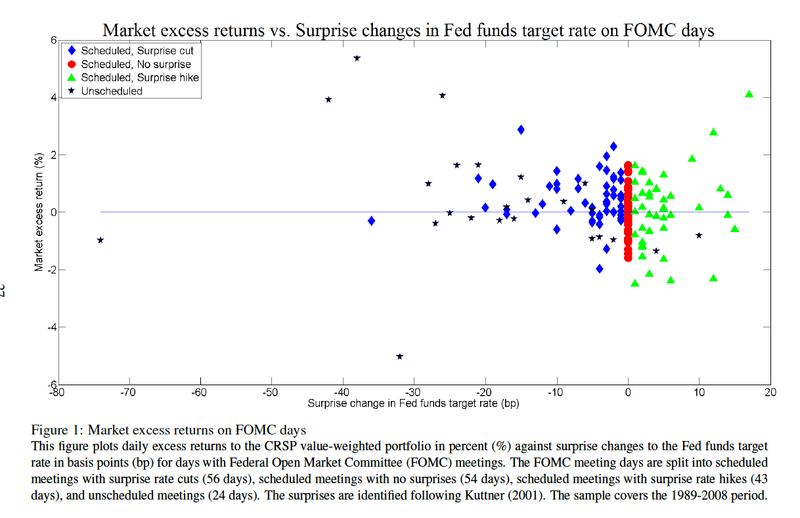 However, the impact of FOMC announcements is actually short-lived. To many who watch the market closely, this result may not be surprising, but it suggests that in spite of the best efforts of the Fed and the market expectations through the Fed funds futures, there are times that the market is surprised and will have a strong equity return reaction. If we use this model to extrapolate what will happen if there is a Fed rate hike, the market reaction should not be significant. Perhaps September was an anomaly. 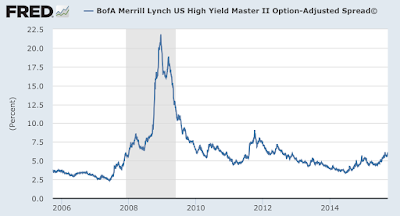 High yield volatility spikes - markets calming? 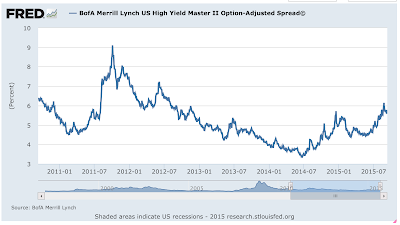 High yield market spreads has been moving to the highest levels in three years. Investors are fleeing the sector especially for names in the energy and commodity sectors. As important, there has been a spike in volatility that suggests the risks from trading are much higher. We looked beyond volatility and measured the number of days in a given month (22 days) where the absolute movement in the index was greater than 2%. The disruptions become very clear. If there is an economic shock, there will be a spread disruption. If there is a monetary shock or uncertainty like what we have seen recently, there will also be a spread disruption. 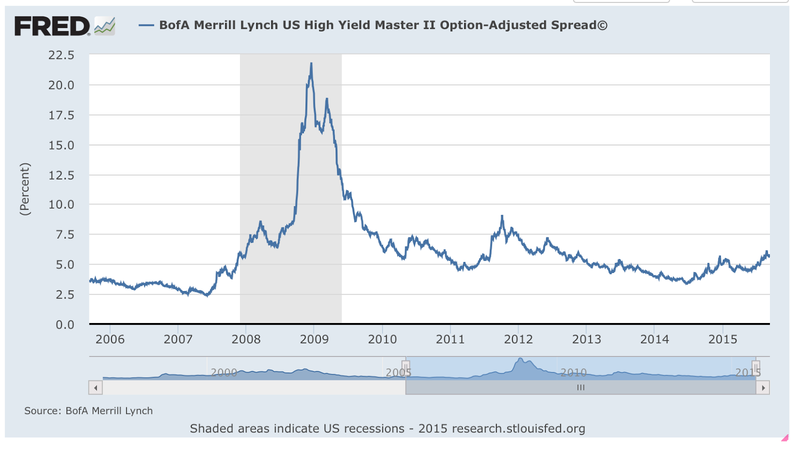 The high yield market is starting to calm, but the next Fed meeting may seem another spike. More likely this will happen in December. Overall, we believe that credit spreads will rise with any further equity market decline. 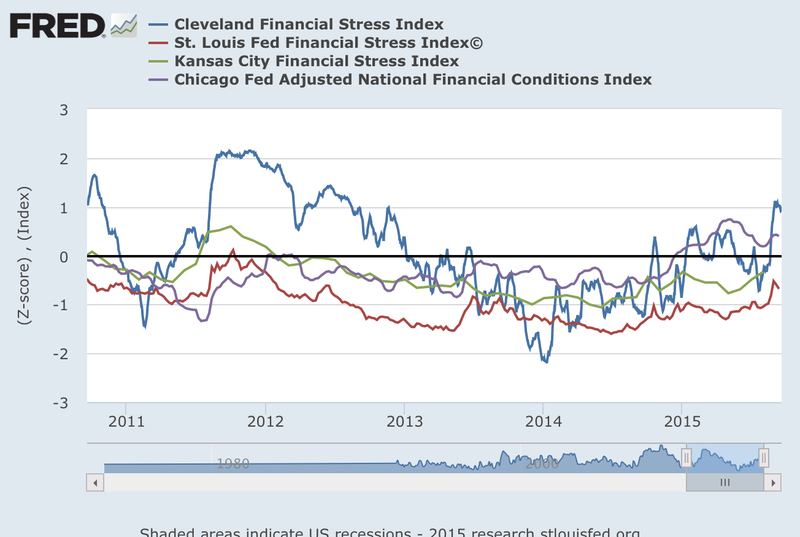 Three economic stress indicators from the Federal Reserve banks of Cleveland, St Louis, and Kansas City show an increase in financial stress. 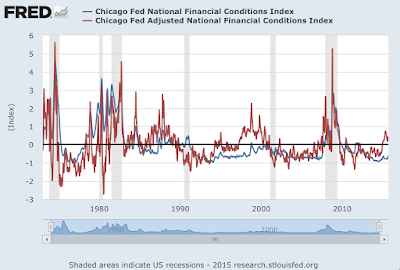 The Chicago Fed financial conditions index shows a tightening of conditions. 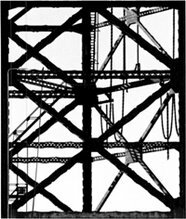 Each is constructed differently but all are trying to capture the same phenomena is there more stress in the markets? The stress indices are correlated with economic bad times. 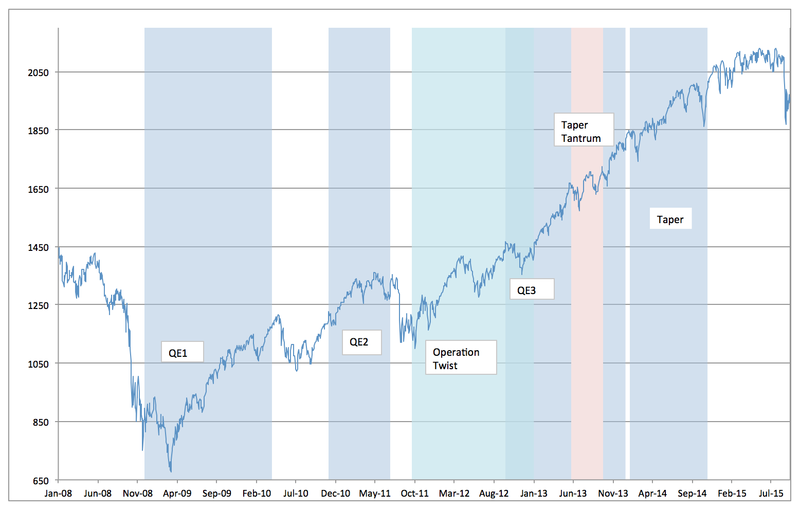 While we are not at levels seen in late 2011 and early 2012, the direction is clear. All are showing higher levels from a year ago. It would be hard to say that credit and Fed policy should be tightened in a growing stress environment; however, this places more structure around the current language of the Fed. The nice part of looking at the stress measures is that it gives historical precision to any discussion on current financial conditions. It is not a matter of "feel". The financial condition index from the Chicago Fed is also increasing. This is not a stress index, but conditions will usually tighten when there is stress, or stress will show up as tighter financial conditions. 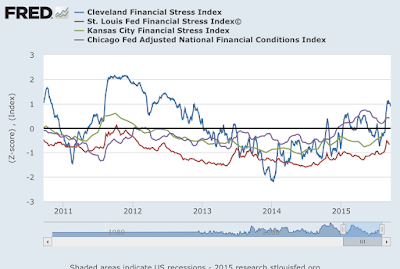 Financial conditions as measured by the Fed is more than just credit availability. Good prediction is about getting the direction and timing right. You can be right but too early; nevertheless, any investors should be aware of signs of changes in direction and intensity. Since confidence and stress are an important part of growth, we can say that there will be less risk-taking if stress continues to move higher and financial condition deteriorate. Financial conditions are the worse since the Financial Crisis and stress is at level that created a need for an extension of Operation Twist QE3. 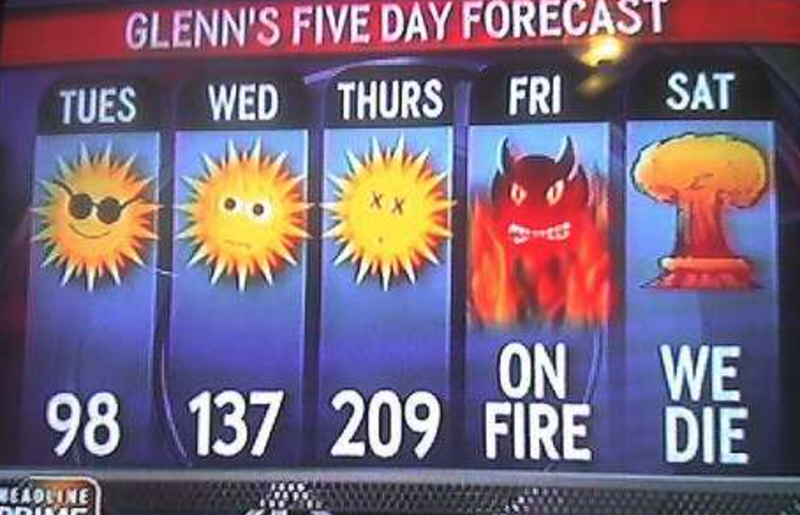 We will watch these stress numbers closely. 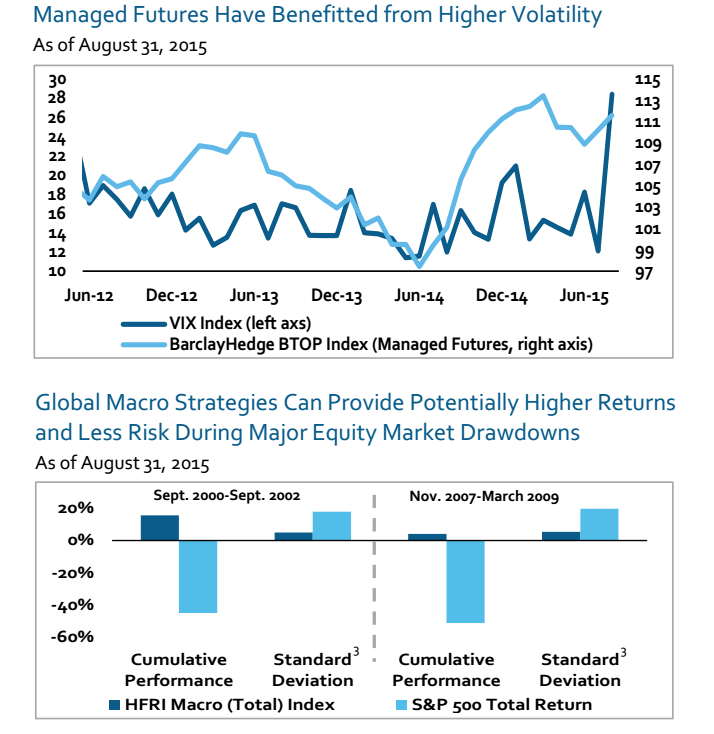 A recent Morgan Stanley report presented the following chart on the performance of managed futures and global macro strategies. The first conclusion from MS is that managed futures will do better in higher volatility environments. 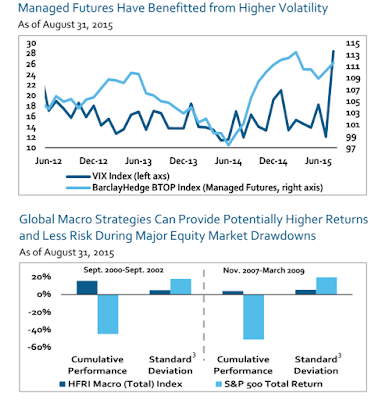 The second chart states that global macro will have better return to risk in equity market drawdowns. The same conclusion has been a key foundation for choosing managed futures. I am a strong believer in the value of global macro and managed futures during crisis periods, but the first assertion that managed futures does better in higher volatility environment is not always clearcut. Managed futures will perform better when there is more spread or dispersion in prices over time but that is not the same thing as doing well when volatility is higher. You can have more spread in prices with less volatility if there is a strong trend in one direction. Volatility can have dispersion but choppiness will also be present. Reversals in a range is dangerous for most trend-following CTA's. 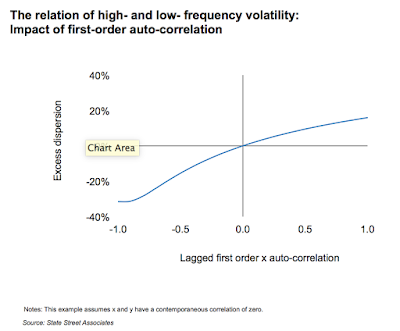 There is usually more positive autocorrelation in a time series when there is higher volatility. 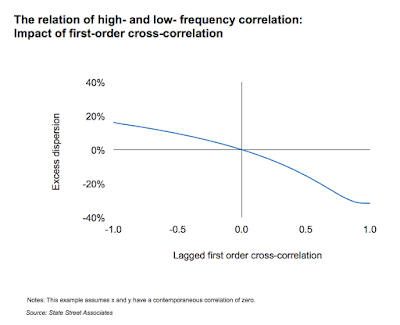 This suggests that trend-followers will do well during high volatility periods, but this autocorrelation advantage is offset by reversal risk. This is why we often focus on the idea of price divergence as the key to managed futures. Global macro should do well in an equity drawdown not because it gets the equity call right, but because they are able to go long or short across asset classes. The diversification of direction and asset class will increase the opportunities available. Global macro should also be able to exploit changes in the financial or business cycle that are not possible from a long-only investment in equities which is subject to a time-varying risk premium. 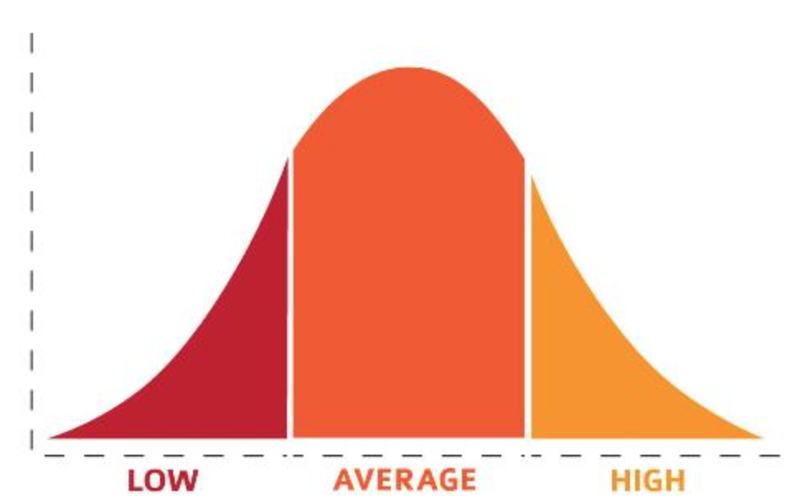 Much of the real world is controlled as much by the “tails” of distributions as by means or averages: by the exceptional, not the mean; by the catastrophe, not the steady drip; by the very rich, not the “middle class.” We need to free ourselves from “average” thinking. There is nothing wrong with focusing on the average or expected value, the most likely scenario. Every event cannot be exceptional, but we have to accept that the exceptional in all parts of life may make all the difference in the world. History is driven by exceptional movements. It is not the march of history but the sprint at key times which have decided the fate of big events. Exceptional events by their very nature are surprises and are not expected. The average is no surprise. The extremes are what cause changes in behavior, changes in outlook, and creates the demand for innovation. Hence, the focus of much investment analysis has to be on what could be unexpected, or what could be at the extremes. The pull of the extremes actually changes the mean, so even if an extreme event does not occur it will still affect expected values. Scenarios should not try and focus on story-telling of what is likely to happen but on what will be the result if a surprise happens. Take the case of the Fed. Currently the likely result is action by the end of the year. The surprise scenario will be not just a delay but another round of QE. Focusing on what would cause that scenario may be more important than joining the consensus. If if this extreme does not occur, the right analysis is handicapping the possibility of this type of an event. 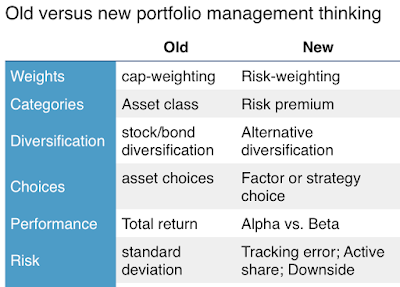 How has portfolio management thinking changed over the last few years? The shift in thinking has been dramatic with new language and focus. I am not referring to how academics think about portfolio management, but the thinking and language of investors or professionals who are doing the actual management. 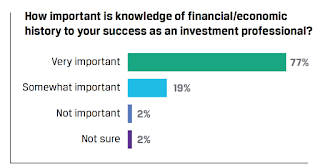 The discussion among investors is more sophisticated and focused on more greater detail. I have divided the change in thinking into six categories for discussion purposes. These six cover most of the change in thinking, weights, categories, diversification, choice, performance, and risk. Managers have incorporated the new thinking at different times but the general level of discussion has shifted radically. Weights - Investor have moved beyond thinking only about capital-weighted allocations and have moved to a risk weighting focus. The advances in risk parity may be the most obvious example. Categories - There is a growing movement away from the normal discussion of asset classes and greater discussion about the risk premiums associated with asset classes. This has not taken hold as well as other ideas but the discussion is shifting swiftly. Diversification - Diversification is not about mixes of traditional assets, but the weighing of strategies and choices within the alternative space. Alternative are here to stay as diversifiers. Choices - The choice in the old world was about asset classes. Now the focus is on strategy and factor exposures. How much exposure to inflation is becoming more relevant than discussion of how much exposure to bonds. Performance - Performance discuss used to be just centered on total return. Now the shift has been on alpha generation and the management fee for beta. Hedge funds are especially feeling the pinch in this breakdown between alpha and beta. Risk - Risks discussion used to only be focused on the standard deviation of the manager, asset, or portfolio. Now the focus is beta, downside risk, the tracking error versus a benchmark, and the active shares within a portfolio versus a benchmark. The ability to slice a portfolio into risk factors has increased significantly. 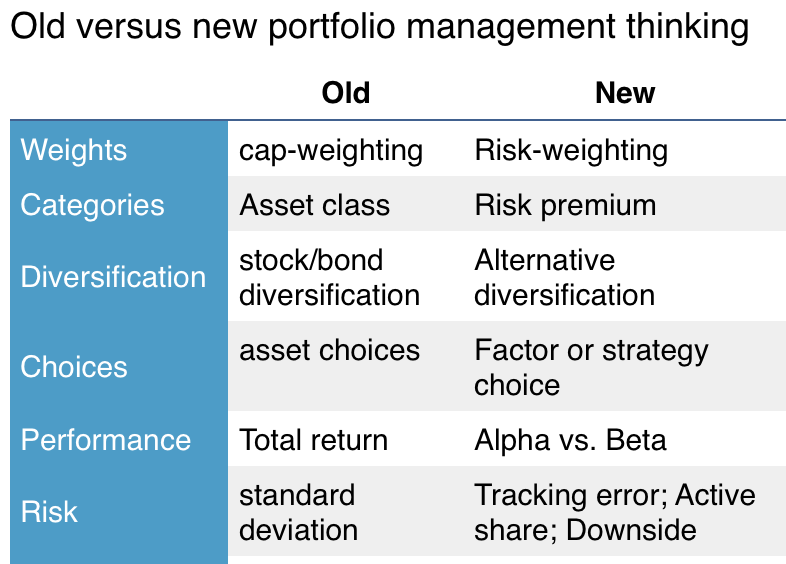 This is just a quick discussion, but most can see that the language of portfolio management has changed significantly. Crisis Risk Offset (CRO) as an asset class - another fad? The pension marketplace is abuzz with talk among consultants on how to categorize the usefulness of different investment strategies within a portfolio. Pension Consulting Alliance (PCA) has come up with a novel name and approach, Crisis Risk Offset (CRO), as an asset class category for managers who will have low correlation to growth risk. Academics will refer to this as negative consumption beta or the ability to do well in "bad times". Put simply, if stocks, as a growth asset do poorly, there should be a portfolio of managers or strategies that do well. We will not go into the theory of what this means other than to say that investors want assets or strategies that will do well if there are business cycle or consumptions risks. This is a good simple framework and gets to the heart of portfolio diversification and the need for low correlation when traditional markets go down and get more correlated. Pension funds should hold a percent of their portfolio in managers who have this low correlation to normal growth (beta) investments. The percentage is associated with an investor's risk tolerance. The types of managers in this category include: Treasury duration managers, trend-followers, discretionary global macro, liquid risk premium alternatives, put buying, and reinsurance. Treasury duration managers take advantage of the flight to safety in a crisis. Trend-followers have the ability to go long or short in major asset classes based on price trends. Discretionary global macro managers can move between changing opportunities. Liquid alternatives associated with risk premiums can allow for nimbleness with either the manager or investors. Put buying offers tail protection. All have the opportunity to exploit extreme price moves or large market dislocations and still provide, in most cases, liquidity to investors. A category called alternatives does not get to the heart of the issue associated with a crisis. A long/short equity manager will do better only because it may have a lower beta but not because it has a specific focus on exploiting market dislocations. Trend-followers on the other hand have shown the ability to generate extra return when there are market divergences. 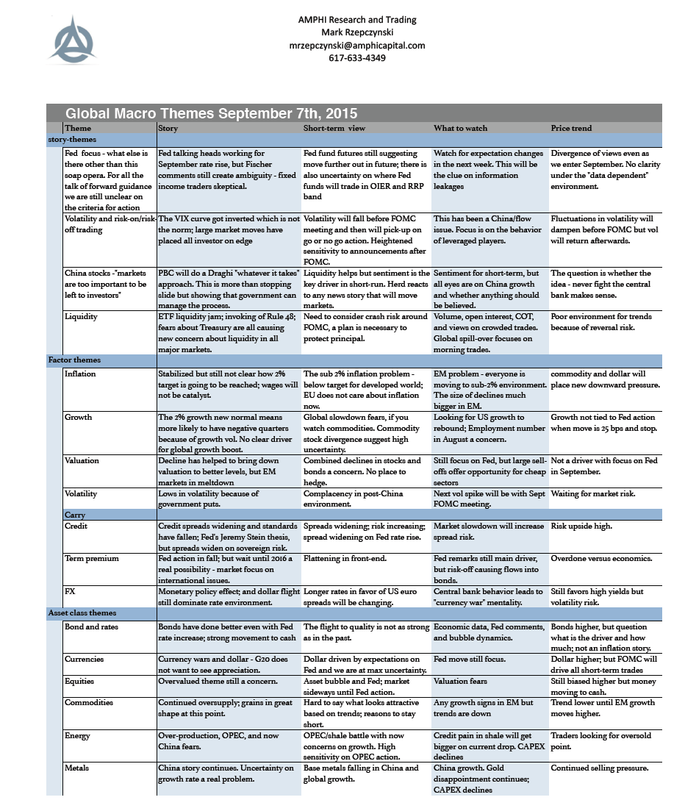 Global macro can both avoid poor performing asset classes and exploit dislocations. Is this a fad? I think this is an advancement with our understanding of asset classes and strategies. CRO improves our language with describing what we are looking for when there is a discussion on diversification. Will this be the only way to describe diversification at the extreme? No, other consultants will develop their own language and description, but this further moves the discussion in the right direction. Buried in a longer article is a very useful quote and perhaps one of the more insight comments on hedge fund managers and due diligence. You cannot control the results. You can only control the process. I am sure you have heard the same thing with reference to great athletes and teams. Teams cannot control the outcome of the game, but they can control their preparation and the process for getting ready. A great runner cannot control the outcome of the race, but they can control their running style. They often win by following a plan. Plans change but there is even a process for dealing with change. Managers have the same structure for success. You prepare and do the homework. You do all of the research to generate or measure the odds of success, but you cannot control the outcome. That is uncertain under the actual event. You can have odds in your favor but when the event is realized it may not turn-out according to the expected value. However, by having a process which creates favorable odds, the manager can great a success track record. Process is everything. Asking about the track record is easy. A good analysis of the track record is harder, but the purpose of the analysis is just to see how the process matches the results. The track record can tell you something about the success of the process and offers a chance for discussing how feedback is incorporated into the process. It is not definitive. Certainly the sample size of performance in most cases is not large enough to differentiate across managers. It is process that matters. We have written about this issue in many of our blog posts on decisions-making. Take a closer look at my postings because this is a recurring theme. The Fed tightening cycle is almost upon us even if no action is taken this month and investors are still trying to sort out what will happen to financial markets. There have been 12 tightening cycles since 1955, so the overall sample size is small. It is even smaller if we focus on the post 1980 period. 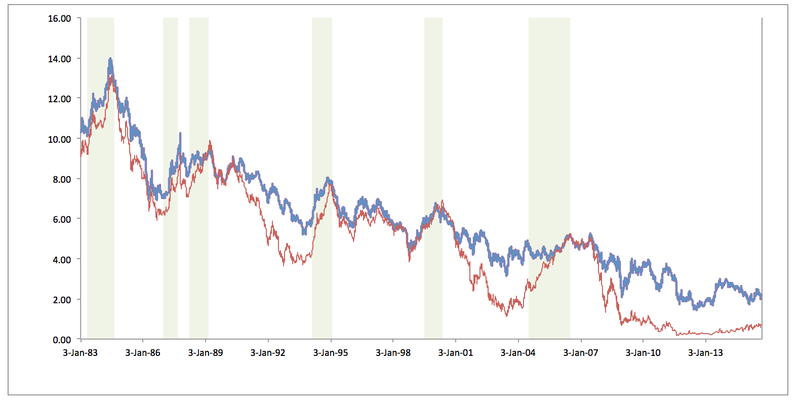 In the last 35 years, there have been six tightening cycles. During those six periods, short rates rose on average 275 bps and the tightening cycle lasted about 59 weeks. Both 10-year and 2-year yields increased in all cases. The graph shows 10-year Treasury yields in blue and 2-year yields in red. The evidence for what should happen is very clear. The market does not like tightening surprises regardless of being warned. The 1994-95 tightening was brutal on bond markets in the spring of 1994. The 1999-00 tightening offset the liquidity injected into global markets after the Asian crisis. The stock market nosedived in 2000 and cut short the tightening cycle. The 2004-06 cycle was a slow march higher than was not able to stop the housing excesses prior to the Financial Crisis. For the 12 tightening cycles since 1955, the average length has been just under two years. The median increase in short rates has been 300 bps but this includes periods of much higher nominal rates. In nine of 12 cases, the stock market moved higher in the year after the first increase. Bond yields have gone up 11 of 12 cases in the year after the first tightening. For the current tightening, Fed's intentions have been clear; nonetheless, the Fed forecasts have been biased to rate increases sooner and more dramatic. These Fed forecasts have been wrong. 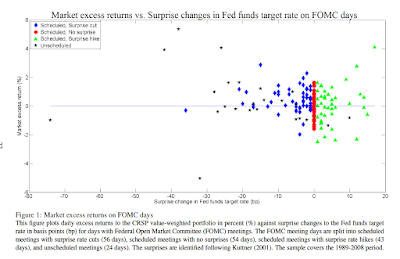 The dot plots from the Fed actually forecasts that the rate increase may be greater than the average increase from our sample of six, albeit the forecasts suggest that the increase will be over a longer period. Holding bonds will not be a safe strategy although bond behavior in a zero interest rate environment may be more muddled. The pattern of behavior between the major developed country trade-weighted dollar index and monetary policy shows a clear pattern between the Fed QE policies and the dollar. QE1 generated a large dollar decline. The same occurred with QE2. Operation Twist and QE3, which were not as strong as the first two QE programs, saw dollar strengthening; however, levels were lower than crisis highs. The tapering in 2014 sent a signal that the quantity of money creation by the Fed would stop. The dollar strengthened further. The end of the QE programs generated a strong dollar rally which has currently stalled as global investors wait for the next Fed action. With a strong dollar rally for four years, a Fed action may not generate a further strong up trend. 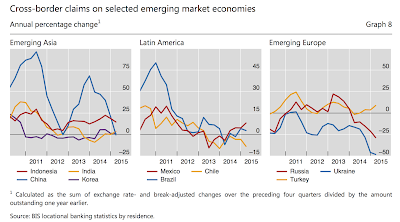 Nevertheless, the ongoing deleveraging of EME and hedging may still place upward pressure on the dollar. The relationship between monetary policy and bond yields has not followed patterns expected by many analysts. Here are the 10-year constant maturity yields compared with the Fed policy actions over the post-crisis period. QE buying generally lead to higher yields except for the Operation Twist period. The tapering period of reduced Treasury purchases produced a market rally. The market yields have been higher on expectations of Fed action since the lows in the first quarter, but the current patterns does not seem to be producing a definitive trend. While there is no certainty on what the FOMC will do at their meeting this week, it may be good to review what has happened to the stock market during periods of QE versus periods of no-QE. The table above shades QE1, QE2, Operation Twist, and QE3. 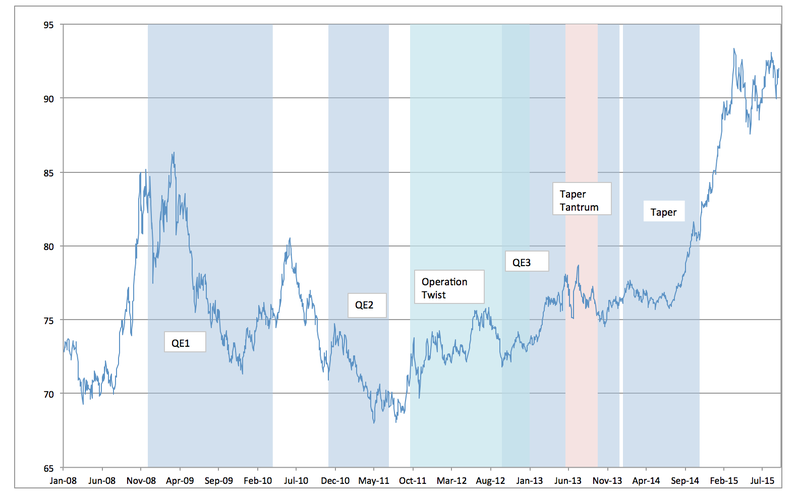 There was a overlap between Operation Twist and QE3. 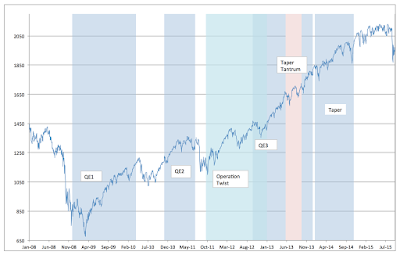 We have also highlighted the taper tantrum period and the actual period of tapering. The markets are facing a new monetary regime where the Fed will try and control the range or freeze short rates between the IOER and reverse repo rate. It will be a new policy choice, and a close look at the past transitions tells us the market does not like these changes. We have already seen the impact on stocks in August. Stock markets hate change especially when the cost of credit or the availability of reserves declines. The transition to higher rates is a change that will make markets uncomfortable. The action may be delayed but the this transitional date will come. One of the big lessons we were supposed to learned from the Financial Crisis was that too much leverage will come back to haunt any consumer, investor, or country. There is no room for error. High leverage leaves no margin of safety. Banks were to delever because we understood that financial and credit channels have macroeconomic effects. Companies need to have a cushion for when earnings decline. Consumers need to worry about excessive spending and leverage with illiquid assets like real estate. There are some exceptions with austerity in some countries, but it has been more a slowdown in trend as opposed to reversals in direction. Of course, central banks then made the cost of money go to zero so that it seemed crazy not borrow. Real rates were negative and in some case nominal rates went below zero. The result should not be surprising, firms, consumers, and government will eventually show fiscal prudence but perhaps later. 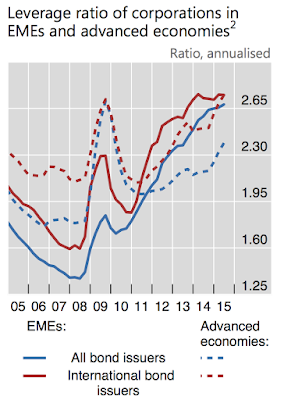 The BIS Quarterly Report provides one scary chart on the leverage in the global economy. 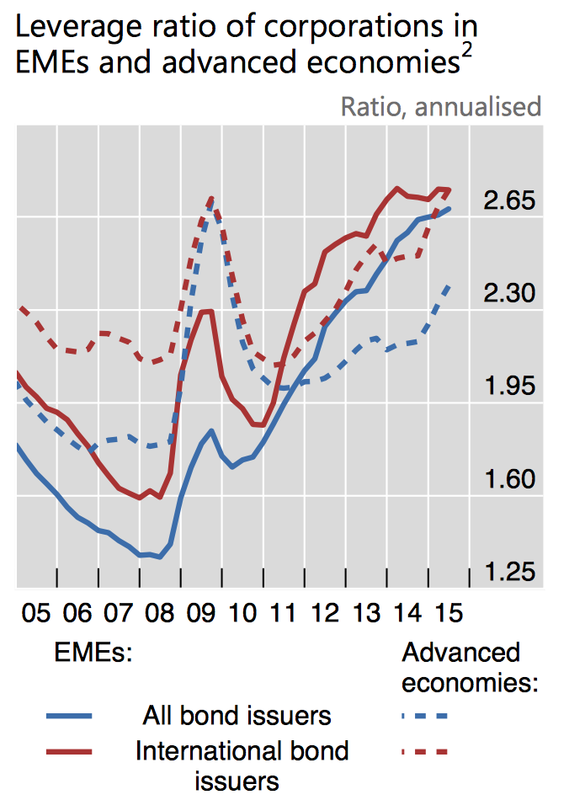 The EME countries are all above the crisis levels of 2009. The advanced countries are also trending higher although the all bond issuers are still below highs. The EME levered up on cheap dollars and now we are seeing the fall-out. The downtrends will continue in these countries because the fundamentals tell a bad story. All the talk in currency markets has been about currency wars as if the central banks of the world can just adjust prices on a whim based on what they want to see their exports to be in the global marketplace. This is an overly simplistic view especially with respect to the EM currency declines over the last year. In reality, the foreign exchange price is not under the complete control of central banks when there is free flowing capital that moves around the world. 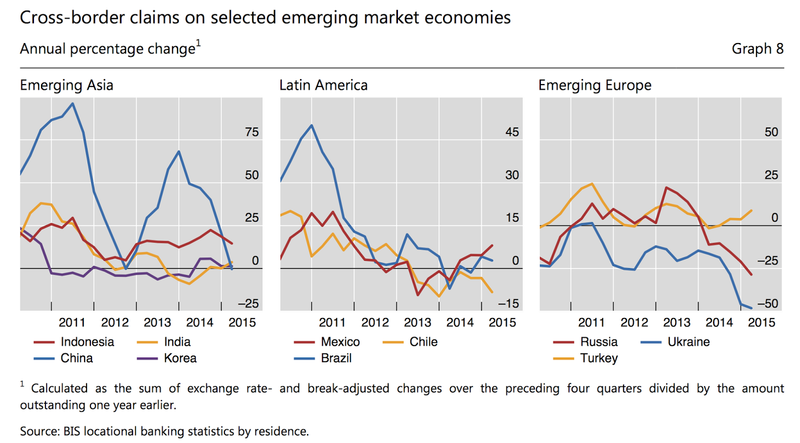 Money is not flowing into emerging markets. The big cross-border flows of the post crisis period are over. The diversification gain from playing EM under the theme that this time is different is also over. The cross-border claims in debt were often done in dollars so now that the dollar has increased and rates are expected to go up money flow has stopped. We have seen this story in the 1990's and 19080's. Forget the long-term benefit from investing in EM. Short-term investors sensitive to yields are moving out of these markets which cause outright declines in growth and increased hedging. These flows are creating the downward price momentum in currencies. Now central banks have to use their reserves to stabilize the investor exits. "Forecasts may tell you a great deal about the forecaster; they tell you nothing about the future..."
"The only value of forecasters is to make fortune-tellers look good... I continue to believe that short-term market forecasts are poison and should be kept locked up in a safe place, away from children and also from grown-ups who behave in the market like children." 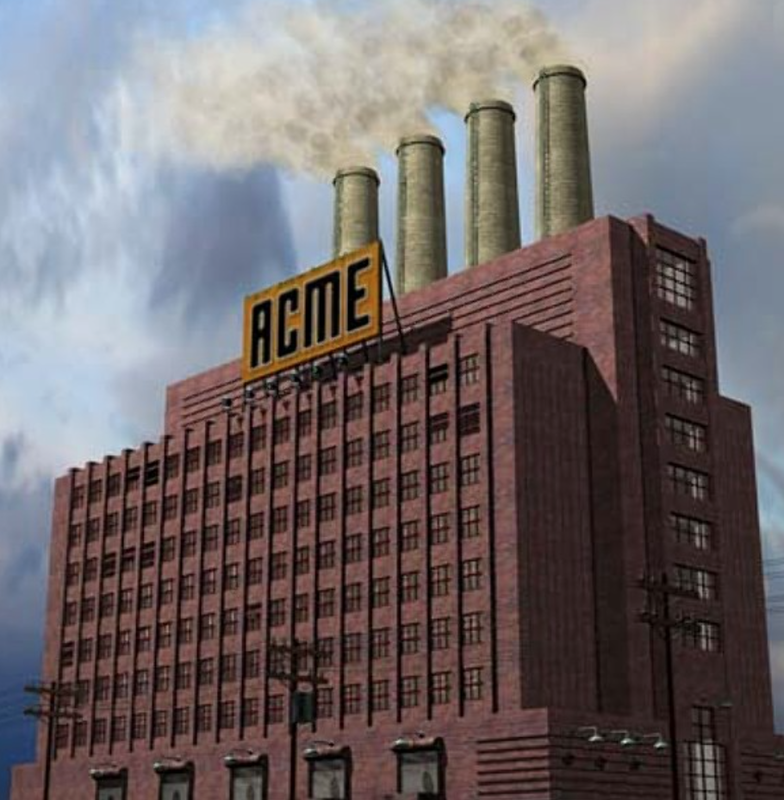 With the FOMC committee meeting this week, we may finally have the answer to whether the Fed will raise rates. It may come, then again it may be delayed. While many have said this increase has been telegraphed, it is not clear whether investors have heard the message or know what is the right message. Given the difference of opinions there will be movement after the announcement, that may be the only given. We will then move forward and focus on a new event that consume our time. Given the likely size (25 bps) and the fact no excess reserves will be drained, the market react will not be clear. Reserves will not be reduced as much as frozen by being held at the Fed at the IOER rate. The actual rate increase will be somewhere between the IOER and the reverse repo rate. It will be a channel controlled by the Fed. 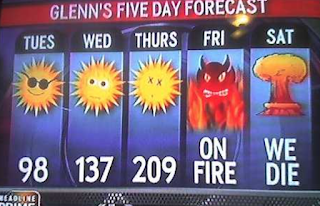 At this time, the folly of forecasts is still present. Markets are discounting a different event from economists and fed officials have given conflicting signals. There is no clarity and the market will behave accordingly. Information concerning markets is diverse and traders are faced with multiple dimensions or sources of uncertainty. The sources of information especially for macro trading is varied. It can be government economic announcements, policy changes, speeches, capital flows, hedging behavior, and in the case of most global markets, this information is across numerous countries. All of this information is subject to revisions, uncertainty, volatility, ambiguity and complexity. The level of complexity between information and uncertainty causes many traders to specialize and find comparative advantages in different types of information gathering and processing. Some traders follow flow, other follow firm fundamentals, macro information, or technical price information. Some will be micro traders getting into the specifics of firms while other focus on macro risk premiums. One trader normally does not do it all in terms of processing information. 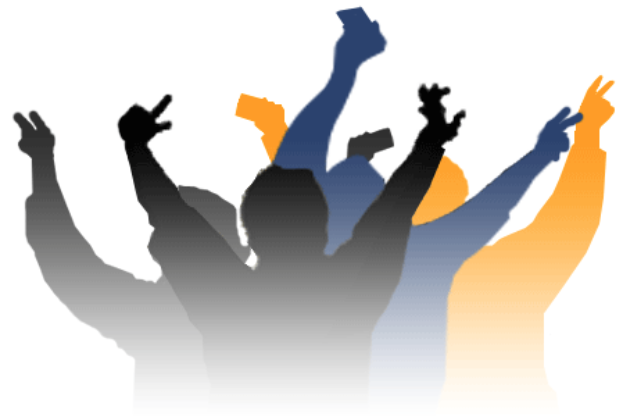 Consequently, market prices are determined by the combination of different types of informed traders. The diversity of information and specialization is what makes for active trading and differences of opinion. Market prices combine all of this information but the process of aggregation is not the work of any one but a set of individuals. Given this diversity of information processing, there are some interesting questions concerning how markets participants behave relative to other traders. If a group of trading specialists have more information and trading more aggressively, there is a question whether other groups will also trade more aggressively or whether they will be deterred from using their information. If more aggressive behavior leads to other trading groups also to get aggressive, there is strategic complementarity in their behavior. If aggressive behavior deters others from trading, then there is strategic complementarity. These issues are addressed by Itay Goldstein and Liyan Yang in "Information diversity and complementarities in trading and information acquisition", paper published in the August Journal of Finance. This paper deals with the complexities of how information from differences sources are used and exploited by other traders. If some traders use their information more aggressively, there can be an "uncertainty reduction effect", because other traders use or exploit there area of information advantages after they see these other traders act. However, there can also be an "inference augmentation effect" which causes some traders to not use their information as aggressively because there is more information from other sources that is moving prices. This is not an easy paper to work through, but it does cause some interesting thinking. Diversity of opinion and types of traders in any market is a good thing. It helps to resolve uncertainty. In fact, different traders can confirm price behavior and make others feel more comfortable with their own trading. Take the case of the trend-followers. He does not follow fundamentals, but if fundamental traders are being more aggressive in their behavior it may make following trends easier. The fundamental flow will reinforce what is being told in the price dynamics. Without aggressive fundamental traders, trends may be more erratic. Similarly, if hedgers (producers) are aggressively changing their positions, this provides information to managed money investors who can infer information from this hedging behavior. Use other information outside your trading comfort zone to improve the use of your own information trading specialty. Follow the skill of others to help your own decision-making. 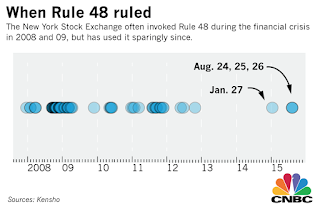 Rule 48 was approved at the end of 2007 to allow flexibility for opening and pre-opening indication of stocks that are facing volatile conditions. For market-makers, the rule lets them off the hook at providing pre-open price indications when there is a order imbalance. It has been invoked 77 times since 2008. This is different than a trading halt. When Rule 48 is invoked, the designated market maker can actually open up stocks quicker than normal. Under the normal procedure an exchange official has to approve the opening price. For investor trading can start sooner in a volatile market but that does not mean that you are going to get a "good" price. You are going to get the price that reflect the immediate market conditions that exist at the opening. 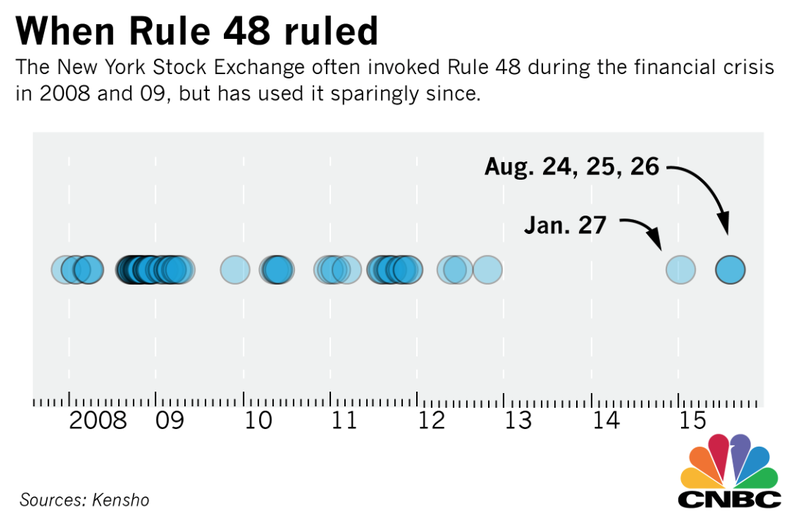 To invoke Rule 48, an exchange would have to determine that certain conditions exist that would cause market disruptions. Those conditions include: volatility during the previous day's trading session, trading in foreign markets before the open, substantial activity in the futures market before the open, the volume of pre-opening indications of interest and government announcements. 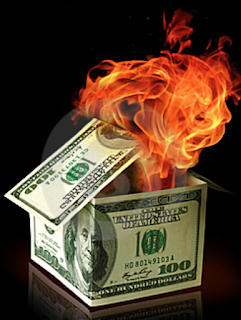 You can say let the buyer or seller beware because it may be anyone's guess what is the true price. What is clear is that the price is going to change dramatically right after the open either up or down. The price at the end of the day could be unchanged from the previous day. Some study suggest that there is limited abnormal close to close price moves, but this does not account for intraday activity. All we can say is that during Rule 48 conditions all bets are off on what price you will receive. It will be based on the order flow at the time but that flow could place the market under significant pressure. Market microstructure matters and trading during the initial period of Rule 48 days is a risky proposition as many have found out this August. Hard hit were some ETF which by definition should just be a basket of stocks which have intrinsic value. The deviations from intrinsic value and trade prices tell us that these are not normal times. The post Asian Financial Crisis of the 90's marked a change in central bank behavior. There were large build-up in foreign reserves by central banks in order to have a war chest available to defend their currency against an extreme fall. Dollar held as reserves could be sold to buy back local currencies to stop a large uncontrolled devaluation. The objective would be to use reserves to protect against a sudden stop as money flows out of the country. There is a desire to stop any feedback loop that will lead to currency overshooting. 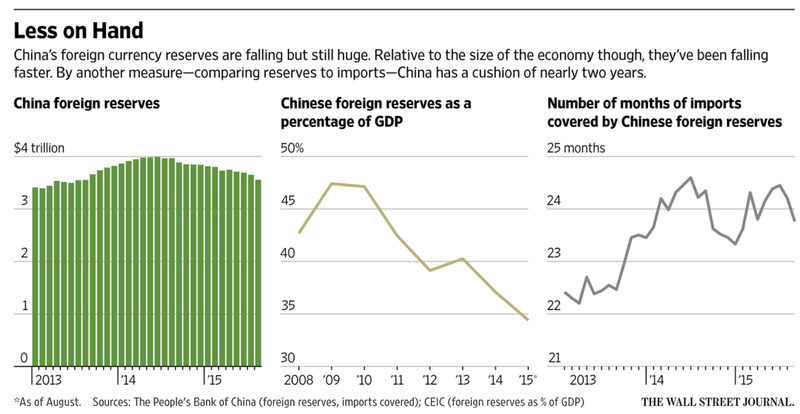 The foreign reserves of the PBOC are being put to the test this summer. Though there has been a 2% devaluation of the yuan, there could be easily a further fall if the PBOC would allow a free float. The tight link with the dollar has pushed the yuan to levels that can be sustain at current growth rates. The outflow of capital even with capital controls is placing pressure on the yuan and the central bank. It was announced that foreign reserves fell by 93.9 billion in August. 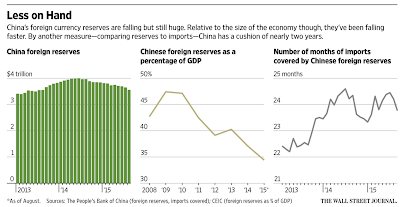 The overall foreign reserves at the PBOC has fallen from $4 trillion to about $3.56 trillion since a year ago. If there is a Fed lift-off, this outflow could continue as money flows to the US dollar. Similarly, volatile financial markets are causing Chinese investors to move more capital offshore to safer assets. The devaluation is not something that the PBOC may want especially if it cannot be controlled. As with the stock market, foreign exchange rates are "too important to be left to the markets". The impact has been a decline in Treasury holdings by the PBOC but these holdings are likely on the front-end of the curve and will not have an appreciable affect on Treasury prices. Expect further reserve decline and downward pressure on the yuan. This is likely to occur even if there is a Fed decline in raising rates. The most important impact is that more Chinese money will be flowing into US financial markets just when local investors seem more skittish. 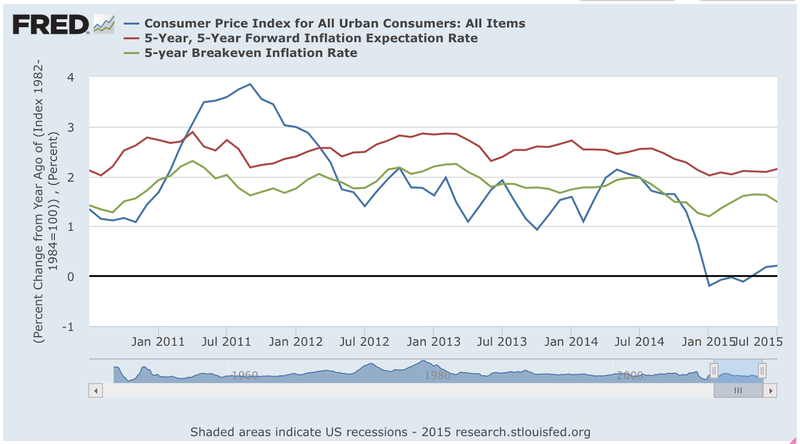 Inflation - too much uncertainty to make judgments? 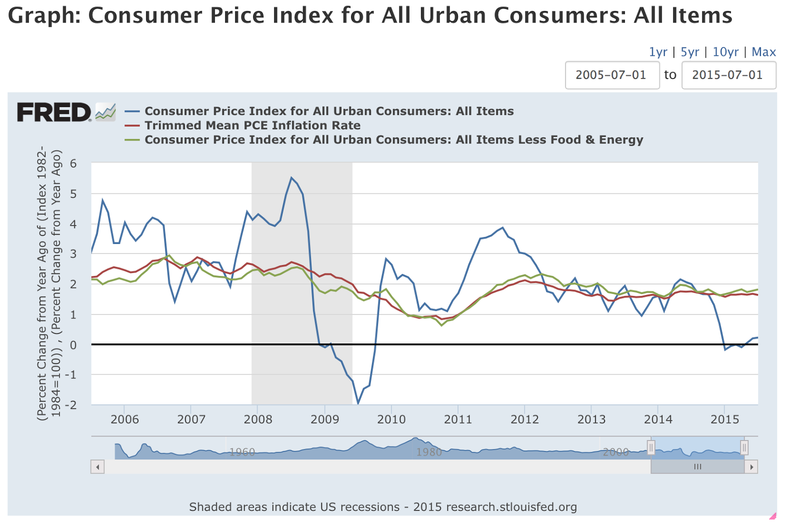 Inflation has been the big puzzle of the post-Financial Crisis period. This was the focused theme for the Kansas City Fed Jackson Hole conference. No speaker came out and said that we don't know the transmission mechanism for inflation, but the focus was on the fact that the link between the real economy, monetary policy, and actual inflation is variable. The lag relationships with past inflation are time varying, and the link between output gaps and inflation seem variable. Core inflation is variable and the shocks in oil or other commodity prices seem to have an unclear link with headline inflation. Unemployment is near the natural rate, but the link with wages and ultimately prices is not as responsive as in the past. 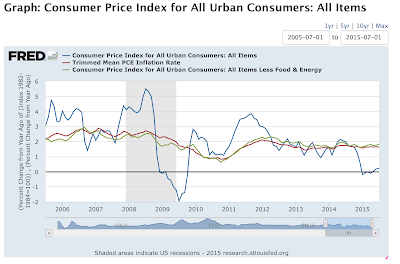 Trimmed mean PCE may give us a stable inflation but this may not be the inflation faced by many consumers. The pass-through from exchange rates to inflation is also variable. This does not even account for the formation of inflationary expectations and how this may feedback to actual inflation. Expectations have been stubborning low in spite of monetary policy that has flooded markets with credit. The story for investors is that inflation does not seem to be responsive to policy or to normal forecasting even if we can decompose a good portion of the low inflation to slack demand. 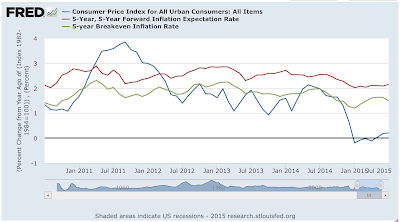 It seems as though the Fed is not emphasizing inflation forecasts as a key determinant in policy. Asset market volatility and international developments seem to have a greater focus at this time. 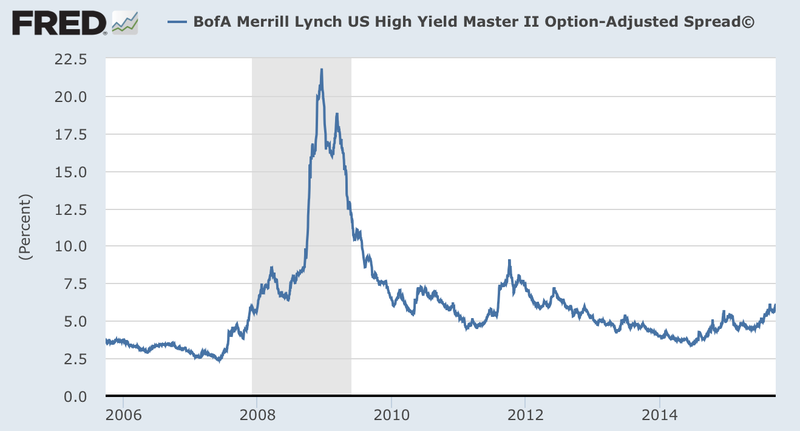 High yield investing has not been good to investors especially in the third quarter. The combination of a second price decline in oil prices, continued price declines in metals, a slowdown in emerging market growth, and a potential increase in rates has all worked to provide a tailwind for higher spreads. This does to mean that there are no opportunities in high yield; however, there are forces for making careful selection more important. Return differences between Treasuries and high yield have widened significantly. 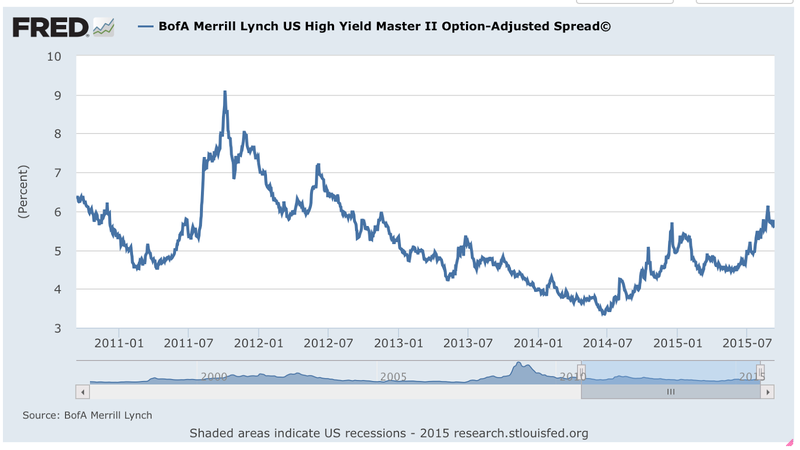 Spreads are close to three year highs as measured by the BAML OAS index. 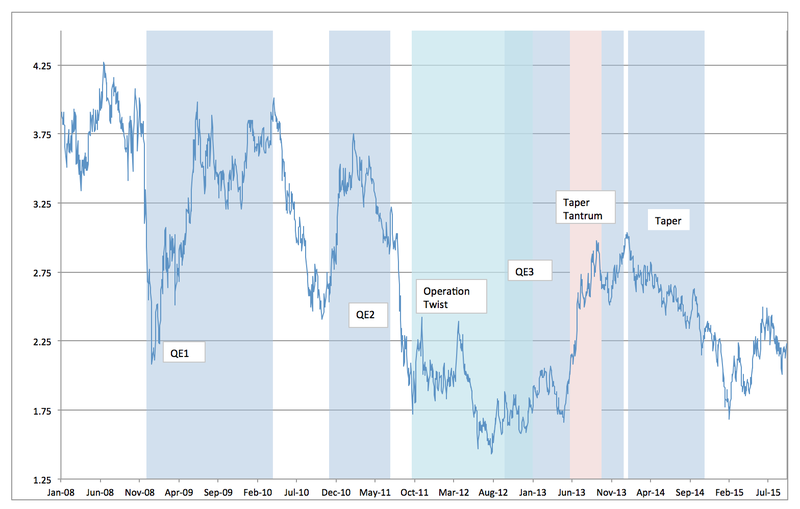 However, we can easily see spreads move 200 bps higher based on the shock in the middle of 2011. That period was one of market confusion about monetary policy and what looked like a slowdown in growth. While the facts were different, we may be facing a similar confusion growth scenario. 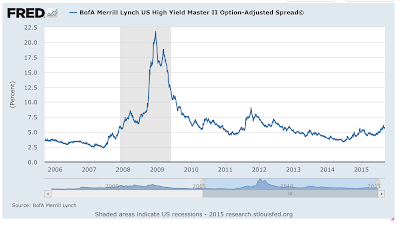 A positive would be the fact that spreads are well off their lows and higher than the pre-crisis level. That may feel good for some investors, but spreads are always compensation for risk and the current risk levels may be higher than the mid-2000's. The big gains from high yield in the post-crisis period may be behind us, so looking at other forms of risk premium or more active credit trading is appropriate. Volatility was the big investment story for last month. For many, this will be the big investment story for the rest of the year. The post-Financial Crisis period has been marked by low volatility punctuated with a few spikes, but the VIX trend and level has been down. Perhaps this is the result of the new normal of slower economic growth, or it could be a function of government policies that try and dampen risk. What is clear is that some forms of leverage have declined so that market sensitive adjustment of positioning has declined, albeit risk parity and VaR models will cause more repositioning by investors on spikes. A focus of August has been the change in the term structure of volatility with the VIX futures curve moving from contango to backwardation. The market did view the level of VIX moving higher but the events that may have caused the volatility spike are viewed to be short-term in nature. The slope of the backwardation has already fallen as has the level of the VIX, but an investor has to move out 90 days to see a flat curve. We suspect that the curve will further flatten and decline after the FOMC meeting. The forecasts in the term structure are already suggesting this decline. With a potential Fed rate rise anticipated in September, there is a large battle between investors and issuers of short-term paper. Investors who believe that there will be a rate rise want to wait to buy any short-term paper. Issuers who have the same view want to issue as much as possible and as soon as possible. Just the opposite applies for those that think the Fed is going to wait. The tilt in favor of the issuers or investors will determine the equilibrium rate before the Fed meeting. There is also a wide difference in opinion with managers who run money funds. The WAM, weighted average maturity of assets for largest money market funds show a range between 12 and 48 days as September 7th. This dispersion tells us the uncertainty concerning whether the Fed is going to go for a lift-off. The short WAM managers are set for a rate rise while the longer WAM managers think that any action will be delayed. A greater dispersion in WAM suggests that there is more uncertainty on whether the Fed will move. This dispersions will have a real impact on future yields for these funds. All funds are not alike and a change in the rate environment is going to catch some investors by surprise. Currently the difference between the lowest and highest yield for the largest money market fund is 18 bps. This should widen in a Fed lift-off environment. All "cash" is not the same. 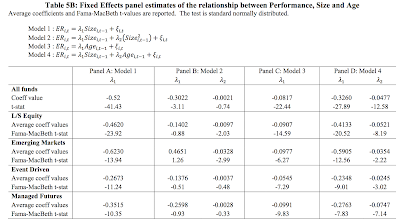 There has been a good amount of research on the effect of size and performance within the hedge fund category. This research suggests that there may not be strong economies of scale. In fact, the opposite may be the case. The most recent research from the Cass Business School in London shows that there is a negative correlation between size and performance. Bigger is not better. The more interesting and unique part of their research is what happens in a crisis. The authors find that small firms do better than large firms during financial crisis. You might say that smaller firms are more nimble than larger firms. They are able to move positions and take advantage of opportunities faster than large firms. This work is not for a small period but represents a 20 year analysis of both funds that have survived and closed. It is interesting that their data set shows that 80% of funds have died over this period. 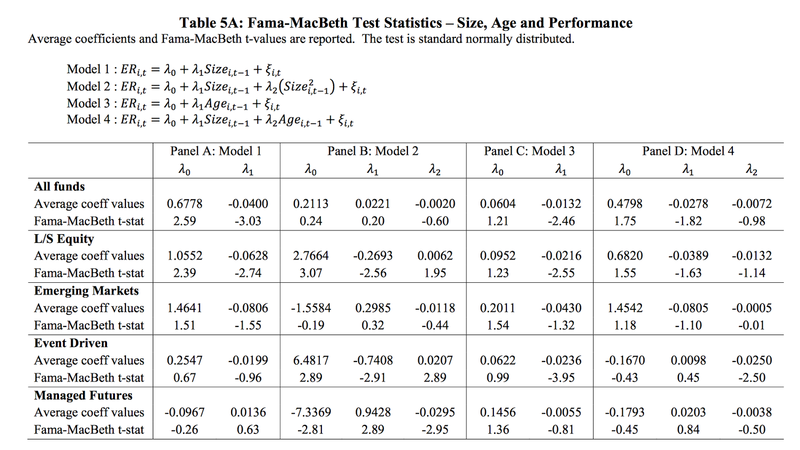 There are few survivors in the hedge fund area; nevertheless, the data also shows that performance declines with age. While this age analysis holds over the entire period, the post-2009 period shows a positive relationship between performance and age. It looks like the industry is changing with more established firms being able to survive and still produce good returns. 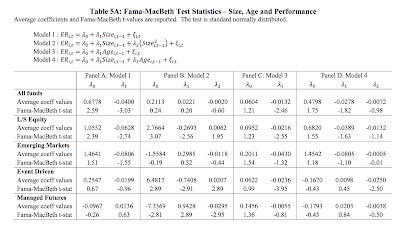 The tables below show the key results from the study for both size and age Another interesting conclusion is that the size and age relationship is not consistent across hedge funds. The performance will differ by hedge fund style. At the extreme, long/short equity has the largest negative effect while the relationship in managed futures is actually positive. 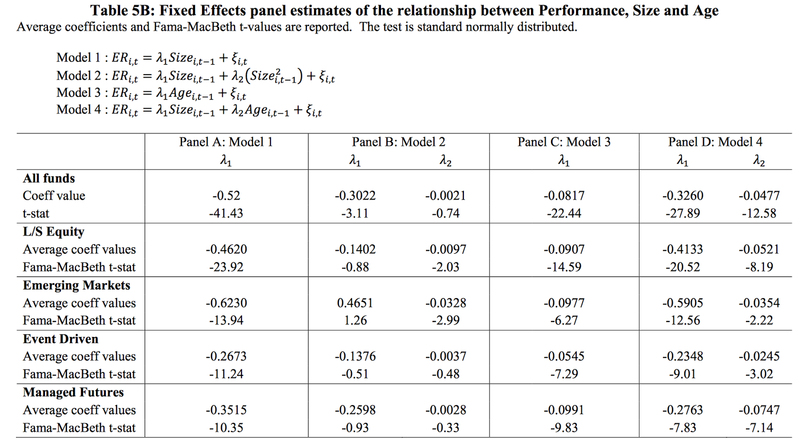 When looking at the tests through a fixed effect panel data, this positive behavior, however, is not present. This work again confirms that looking for the right hungry talent will work in favor of investors. It is worth looking at smaller managers to gain their performance premium before they get too large. The themes have not changed significantly since last month. The FOMC September meeting will be upon us in two weeks. This will be the focal point of market attention. The second key theme is still China stocks. The economic story for China has turned negative with more focus on the overall growth. This focus will continue whether the Fed acts or not. Associated with these two themes are issues of liquidity and volatility. Volatility has returns to financial markets and investors have been surprised by the significant intraday movements. This volatility is tied to the uncertainty concerning the Fed and the implication of a global growth slowdown lead by China. Liquidity is coupled with volatility. Investors will learn whether the market can sustain continued selling pressure. All firms have not reported returns for the month of August, but a review of a selected number of managers suggest that there was wide dispersion in performance across managers. The Barclay Hedge, BTOP 50, Newedge, and HFR indices, on average, showed a decline of just under -2%, but within those numbers are managers who showed strong gains, flat performance, and poor numbers. When markets show sharp declines and there is a increase in volatility, there will be greater dispersion in manager performance within the managed futures and global macro category. 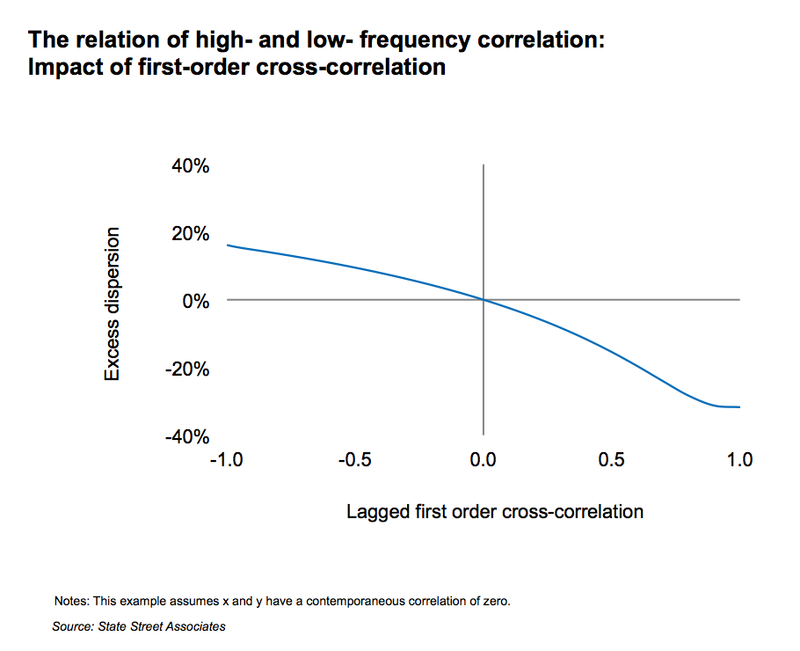 In fact, this will occur across all hedge fund categories.The cross-sectional performance will be show bigger dispersion in down markets because management differences whether stop-losses or derisking become more relevant and important. Clearly, difference in style within global macro and systematic managers becomes more relevant in these more volatile markets. There will be clustering of performance based on characteristics when there are strong market moves. In calm trendless markets, performance could be random. In trending but calm markets, performance may seem regular, and at market extremes there will be clustering based on characteristics. Let's take a simple example. If there are well defined trends, with constant volatility, it is likely that many systematic managers will have the same trades and thus similar performance. This is likely even if the manager is a short-term or long-term trader. The correlation across managers will be high and all managers will seem to be alike. In calm trending markets, all managers seem to be generating similar "beta". Only when there is a higher volatility and return dispersion across markets will the nuances of managers start to become more prevalent. For example, differences in stop-loss management would have had a significant impact on performance especially since there were some song reversals. This that either had or did not have equity exposure would have been a strong driver of performance differences. Volatility targeting would have placed a big roll in cutting position exposure during August. Hence, due diligence and the picking of managers is more important during these extreme periods. Diversification matters at the extremes. Of course, the managed futures and global macro did much better than the down 6% in equity markets, but the average firm did much worse than the Barclay's Aggregate bond index which was flat for the month. Global macro would have outperformed a 60/40 stock/bond mix but that is only if you had the average return. August was a month of volatility management with the return of RO/RO trading based on macro events such as China and Fed thinking. It would have paid to have held a portfolio of global macro managers with different styles in August. Basel III, the new set of regulatory standards for banks, is focused on macro prudential policies to reduce the systemic risk in the global banking system. Who doesn't want a reduction of systemic risk, but this new regulatory environment will have a real cost on all traders especially for those who trade futures. Futures have always been a clearing area that was less capital intensive. This is going to change radically. There is always the law of unintended consequences or second order effects when there is a change in the regulatory environment. Here, the unintended consequence will forcing smaller managers out of the market. The new regulatory environment will hit hard those who are less active traders and those who focus on commodities. The increase in bank capital requirements from 4% to 6% means that the cost of capital will increase. Fewer types of capital will qualify as Tier 1, additional capital buffers have been introduced, and the risk weighted assets definitions have changed. Banks will have to make more with less to keep ROE at target levels. There will be a large increase in capital required for risk weighted assets. Banks will have to be more sensitive to counterparties even for those who trade on exchanges. Client facing risk and CCP risk will both be accounted for using OTC capital rules. Exchange trading does not get any special treatment. Close-out risk is now going to be accounted with recovery assumptions. There will be real costs with knowing your counterparty. The leverage ratios will cause an increased focus on what is on the balance sheet of the bank including the type of collateral held at clearinghouses. There is some confusion on definitions of segregated funds such that clearing firms do not want excess funds, do not want cash, and want as much trading as possible for a given dollar held for clearing. Next year there will be add-ons to leverage risk measures which will make clearing commodities much more capital intensive. The cost of clearing will differ from client to client based collateral used, netting eligibility, the length of time positions are held, and internal credit rating. If you are a small, less active, long-term trader, with limited credit history, then you will see significant increases in clearing and brokerage if you can find a firm at all to clear your trades. There will be more consolidation in the clearing firms and there will be a greater variance in pricing across firms. Clients will have a hard time finding clearing firms to take their business especially if they are at firms that are exiting clearing. Futures traders are waking up to this new world, but the fully impact has yet to hit home. The time frequency for returns will differ if there is any serial correlation or deviation in normality in the return data. Switching between times scales will be a shocker. Calculating the correlation across daily data will not be the same as the correlation across monthly or quarterly data. The correlation in returns between two return series may be high on a daily basis and low on an annual basis. Returns that may have high monthly correlation may have no correlation when looking over 3-year periods. 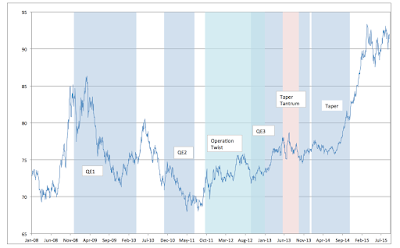 For many investors this may be obvious, but the effects of understanding time scale is important for any financial analysis. It will affect the type of portfolio developed and the weights that will be generated from an optimization. Similarly, the time frequency for volatility will also be affected by the times series of returns. Daily volatility will not scale easily to monthly or annual volatility. Short-term inferences cannot easily scale to annual inferences. Using the square root rule to scale volatility is a dangerous for any analysis. Divergence across scale is different from sampling error when trying to predict. 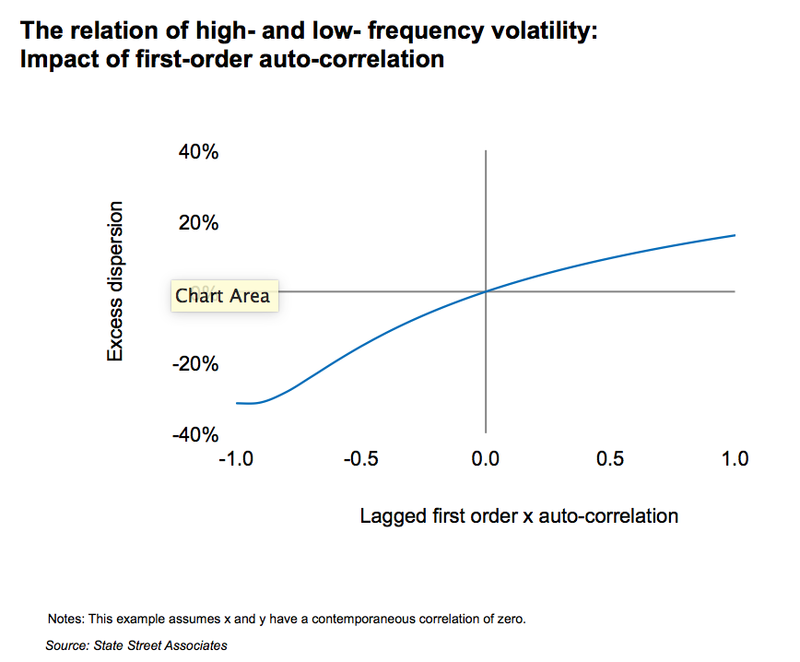 Positive autocorrelation in returns will add to volatility while negative autocorrelation will dampen volatility for longer time scales. This is a an important issue given more hedge funds are reporting daily data and not just monthly data. Are you interested in the correlation over a short time span or a long span. The portfolio you will construct will be very different. Central bank liquidity has been the name of the game around the world since the Financial Crisis. Financial markets have been addicted to central bank liquidity. It is less clear whether real markets have the same addiction; nevertheless, financial prices will move with expectations on the changes in liquidity. Liquidity, however, is not the same across countries. 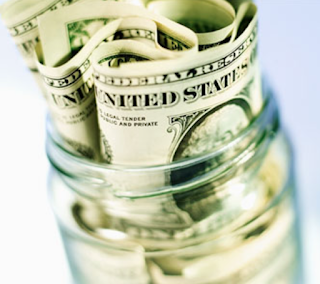 Liquidity from the reserve currency countries will have a greater global effect. The Fed and BOE may have stopped but others are adding, but these additions to liquidity will have more localized effects. A yen or euro of added liquidity may not affect EM growth the same way an increase in dollars. Similarly, an increase in Chinese money will not have the same financial effect as an Euro increase. It will drive China growth which will channel through trade but will have a smaller impact on capital flows. 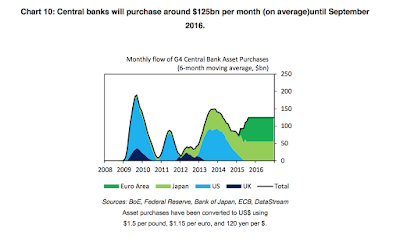 Liquidity may still be higher in 2016, but the mix will be different. This is obvious but still important. Additionally, on a global basis, we have actually seen a slight decline in foreign exchange reserves which affect high-powered money. When foreign reserves are used to support a currency, there is a decline in liquidity. 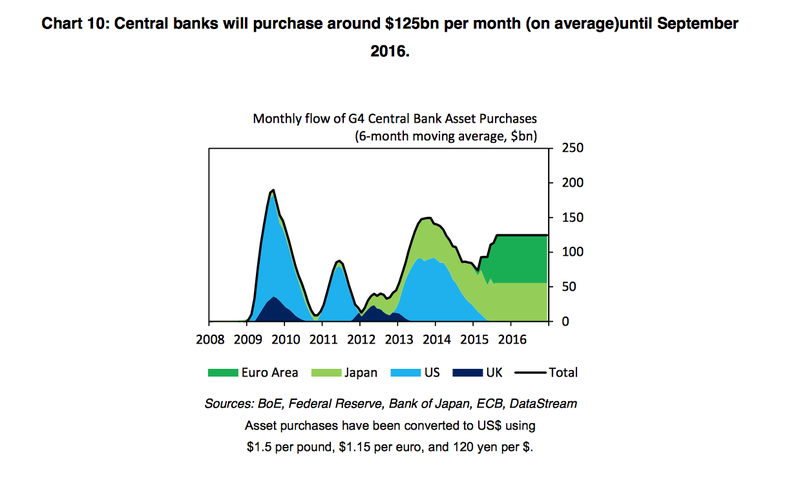 This gets us to the bigger issue with central bank liquidity. When money can flow around the globe, the liquidity effects are much harder to determine or measure.